IT’S HERE! Today marks the release of the new Skype for Business Client update to Windows Update. Much has been written in anticipation of this of late and there are plenty of references I’ve captured below. Until Office 2016 is released, THIS is your client-side update path to Skype for Business: Install Lync 2013 from Office 2013 and then patch it with this (or a later) update & the necessary pre-req’s. 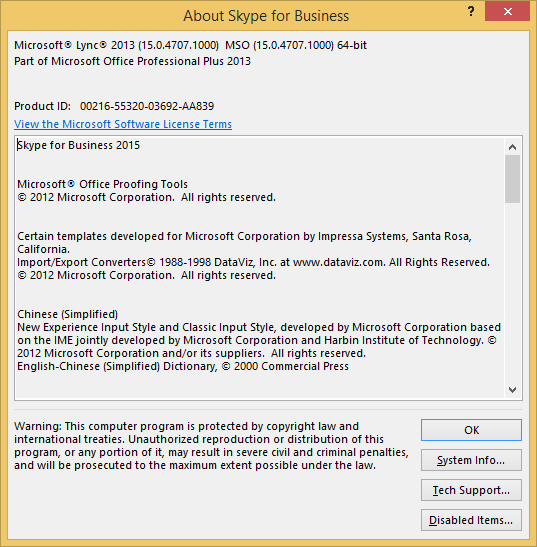 You will also use this patch to turn your “Lync Basic” client into a “Skype for Business Basic”. (Read more of the free Basic client here). What’s fixed in this update? There are no fixes here as applying this patch is installing a brand new client. Whilst you might start with a patched Lync 2013 Client, it’s replaced with the brand new Skype for Business client. Note: these apply regardless of whether you’re running the client with the Lync 2013 skin or the Skype for Business skin. Updated April 16th: : When running with the Lync UI (‘skin’), I’m seeing the title, tray and task-bar icons remain the familiar Lync ones. Don’t forget the pre-req’s as well. Even if your client is patched to current now, the LyncHelpLoc pre-req has also been updated. To suppress the display, create this key and set it to 1 before you let the update run. Here’s a before and after comparison of the x64 client on my Windows 8.1 machine. 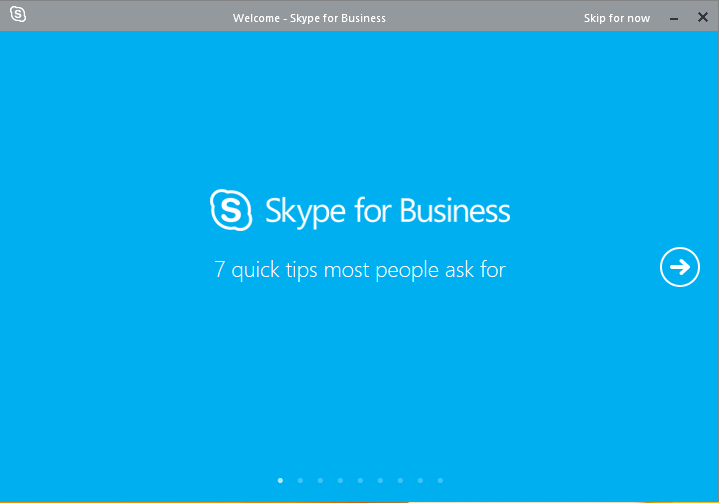 I was previously running the Technical Preview Client, so the title bar was already “About Skype for Business”. So the new version number is “4711”? 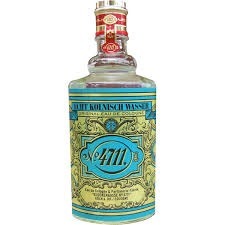 That won’t be hard to remember – that’s my smother-in-law’s favourite perfume! Skype for Business client awareness and readiness resources – aka “SfB_Client_Readiness.zip” (April 2015). 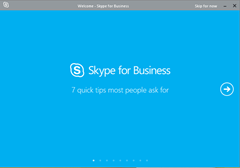 Skype for Business change management and adoption. Set to 0 to view the tutorial on startup. I cant get kb2889923 to update Lync Basic, get the error “No matching Product to upgrade”. That’s strange, as I tested this on a Windows 8.0 machine with no Office and Lync Basic today. Windows update added kb2889853 and appeared to make no obvious difference to the way Lync looked on-screen (other than the change to the “MSO” value in Help/About). I then manually d/l and installed kb2889923 and it went in OK – and we’re now in the expected Skype for Business experience. The end result – regardless of the skin set by EnableSkypeUI – is that the title bar’s dropped “Basic” from the name. It now self-reports as either “Microsoft Lync (Lync)” or “Skype for Business” – but it’s still operating as the Basic version. You can tell that easily by going to the Call Forwarding settings and seeing that the only option you have – one solitary radio button – is to “turn off call forwarding”. We pushed both kb2889923 and kb2889853 with WSUS to about 300 Machines and kb2889853 installed fine on all of them. kb2889923 was installed without problems on all machenes running Lync(about 10 of 300) the rest still got the unpatched Lync Basic client. I got the same result when I try to patch a machine manually. I have a similar issue to Mattias in so much as kb2889923 is showing up as ‘Not Applicatble’ in WSUS for all machines in my University running Win7 x86 + Office 2010 and Lync 2013. We originally deployed Lync 2010 (msi via GPO) and then when Lync 2013 was released we deployed that (again using msi vis GPO) whilst at the same time removing Lync 2010. I seem to recall reading an article recently that explained this is expected when using the msi to deploy Lync but for the life of me I cannot find the blog post!! Take my personal work PC, if I run a report within WSUS the KB shows up as Not applicable but I can’t find out why this is the case. I had a look in windowsupdate.log but nothing stands out. Check you have the pre-req’s. 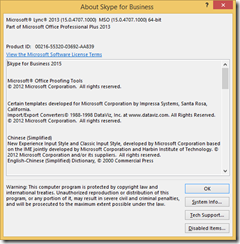 It sounds counter-intuitive, but run Office 2013 SP1 and then re-try the Skype for Business update. 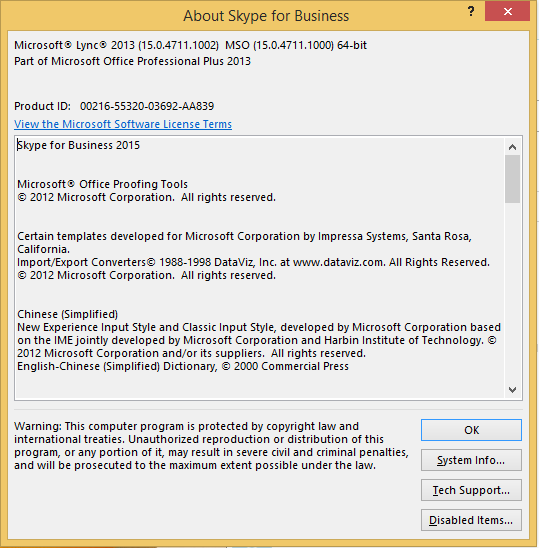 Whilst the REST of your Office suite is still 2010, Lync 2013 is part of Office 2013, and it needs whatever’s in the Office SP1 for it as a precursor to the SfB update. Office 2013 Sp1 was the missing part for me. After installation of Sp1 for 2013 WSUS updated the client to Sfb. Most labels and text still says Lync instead of Sfb. The settings only contains a few alternativs, most of the alternatives are missing. There are several graphic errors in menus, for example help menu and the present tab(you cant se what you are going to present). I get the same problems on all PC I tested on. Can anyone else confirm the the same problems with Sfb basic? My patched-up Lync Basic client is looking as expected here. The only obvious difference is that it no longer says ‘Basic’ in the title bar. What settings are missing for you, and are they missing in both modes (LyncUI/SkypeUI)? Is there any chance it’s specific to the translations? Are you running it in en-US or sv-SE? There is no Basic in the title bar in my client in SkypeUI. In LyncUI there is no text in the title bar at all. The graphic errors only appear in SkypeUI. If I look at the fly-out menue for help there should be three choices, In SkypeUI I only se one of them(I can choose the other two but I dont see the text). I´m also think this could be related to the translation and hopefully corrected in the next upgrade. Office 2013 SP1 is prereq for S4B update otherwise you will get error “The expected version of the product was not found on the system”. [4/14/2015] NOTICE: Support for Microsoft Office 2013 RTM has ended. Starting with the April 2015 release, all Office 2013 updates will only apply if Office 2013 SP1 is installed. See KB2817430 for more information about acquiring Office 2013 SP1. Great post and excellent comments. Thanks all! Lots of errors with KB2889923. Not Applicable and “error occurred while running detection”. I am running into the same issue as Mark. Errors with KB2889923 (lyncmso2013-kb2889923-fullfile-x86-glb), “error occurred while running detection”. Anybody can help for updating the Lync 2013 to Skype for Business…..
We recently upgraded to Office 2013 and now using Lync2013 client (server is still 2010). We are running into this strange issue where during the lync meeting , Lync crashes for few users. What happens is , when the user 1 stop presenting her desktop and user 2 start sharing her desktop, lync crashes for few users and have to re-login. It doesn’t crash for the presenter , but crashes for a few attendees. Usually we have around 20 attendees in the meeting and it happens everytime when user 2 start sharing the desktop during the meeting. We have Windows 8.1 with Office 2013 Std x86 and Lync 2013. It seems we cannot update to version 15.0.4927 and I don’t know why. I tried several updates and none of them are solving our issue. Our Office 2013 Std was already delivered with SP1 so proplussp2013-kb2817430-fullfile-x86-en-us.exe wasn’t necessary anymore but I tried to be sure. Have you tried a Repair of Office? When you say you can’t update, what is the error you’re receiving? What patch version are the clients running today? If a Repair doesn’t bring results, I’d be inclined to give a test machine *several* runs past Windows Update, then look for the pre-req’s for the next patch update following the version they’re running. Failing that, look at uninstalling the most recent Office/Lync updates and reapplying them. Good luck with it. Please let me know how you go with it….